Aquaponics is a type of sustainable agriculture that combines traditional aquaculture of fish with hydroponically grown plants (plants grown with roots submerged in water). The fish are grown in large holding tanks, and the waste they produce is pumped to the plants in the hydroponic systems. 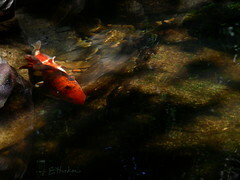 The plants use the nutrients and send the "clean" water back to the fish. That is the general idea behind aquaponics, but there are a few variations. Recently, I have seen a few products come on the market aimed at home aquaponics systems. Some are good, and some are bad. This is one of the bad ones I recently stumbled upon. Some quick facts about this product: it holds 2 gallons (7.6 L) of water; is powered by a 1.5W air pump; is 6.5 inches (16.5 cm) wide; and can come with a light if it cannot be placed near natural light. More information can be found on their kickstarter page. 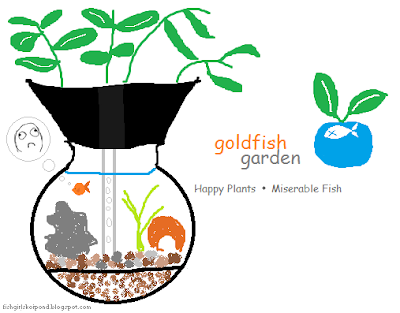 The entrepreneur claims that goldfish are the best candidate for the bowl because of the amount of waste they produce, but he neglects to mention that they will outgrow a tank like this in a matter of months. He also fails to state any need for water changes. Not only do fish need clean water, but plants need it, too. Plants use up minerals that are in the water like calcium, magnesium, and iron. The only way to replace these minerals is with a water change, something that is rather commonplace in normal aquaponics operations. He also fails to mention any additional fertilizer that will likely be needed for healthy plant growth. Fish only produce nitrogenous wastes, but plants need many other micro and macro nutrients for complete and healthy growth. He does mention that other fish can be used in the system and even mentions a slot for a heater to enable tropical fish to be used in his system. This is a very smart idea, and I believe this product could be better marketed and used with creature suited to living in a (relatively) small environment their whole lives such as betta fish, small snails, or shrimp. Or you could save a few hundred dollars by buying a 10 gal tank with a single T8 and putting the plants in with your fish. That's where my vote is! I am writing to ask that you take down the image posted in this blog due to copyright infringement. I am the owner of this image and did not give you the rights to use this image on your blog therefore I ask that you take it down immediately. Sure... I'll take the image down, but the bad review still stands. Your kickstarter article completely fails to address the welfare of the goldfish, which will become severely stunted or die a premature death in a tank like this. It can hardly be marketed to people who want to be "environmentally friendly" with flaws like this.